Early last week, ( September 8, 2009 ), I decided to take my camera downtown to snap some random photos. I had to pick up my mail from my box at the UPS store in the Petro Canada Tower, and I was meeting Michelle for dinner in Chinatown afterwards anyways, so it was a good way to kill time while I waited for her to finish work. In 2002, city council scrapped a deal to rebuild the area with private developers after an audit examining the bidding process and merits of the joint-venture agreement. The estimated $200 million it will cost for the current East Village infrastructure upgrades — which the city says are necessary for developer interest — is being funded through a program called tax-increment financing, which sees the city pay for the work and then recoup the investment when the upgrades attract new development and increase property values. 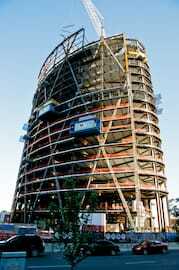 The property taxes from the Rivers district — which includes the under-construction Bow tower — will help pay for the work. Actually, the reason this area is even being rebuilt right now, is because of The Bow Tower. You see, the boundaries of East Village Rivers District used to be 3rd Street SE. 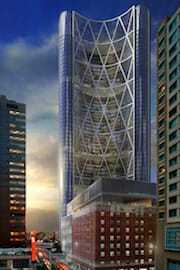 But in 2004, while planning on The Bow was already underway, the Mayor Bronconnier and city council approved that boundary to be extended to Centre Street, so as to include The Bow Tower. Why? To use the property taxes from The Bow towards revitalizing East Village. 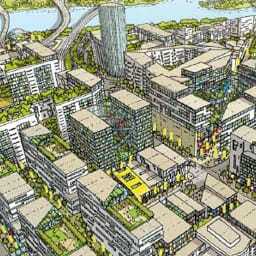 In November 2004, Calgary City Council approved, in principle, the use of tax increment financing (TIF) as a strategy for the redevelopment of Calgary’s Rivers District. At that time, a review of TIF practices was requested to help guide the potential implementation of TIF in Calgary. TIF is a financial tool that allocates future increases in property taxes from a designated area to pay for improvements only within that area. Yup, only within that area. Which is why it was necessary to redraw East Village’s boundaries to include The Bow. :-) And now, the $14 million yearly property taxes from The Bow have to be used in East Village. East Village Master Plan was published on Wednesday, September 16, 2009 at 4:59pm MDT by Daniel Menjívar and last updated on April 11, 2018 at 9:30pm UTC .